Laser Photonics maintains an in-house applications laboratory for processing customer samples and assisting with process development. 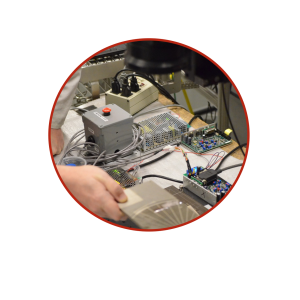 Our R&D team stands ready to modify standard systems or design specialized systems as new industry challenges arise; adapting to changes in manufacturing with continuous system improvements as new, viable technologies emerge. *In-house sampling and live demonstrations are available by appointment only through our sales team. For cleaning applications, we provide the highest quality analysis of each and every mark using our Surface Quality Assessment™ (SQA™) software. With our SQA™ software, we have the ability to guarantee and verify the accuracy and quality of our surface treatment. Call us at 407-804-1000 or fill out the contact form below with your project details if you need any assistance determining which capabilities best suit your needs.